Well, don’t worry illiterates and empty-headed, jargon-spewing corporate drones. Because today I’m pleased to announce an all-new feature here at The Norman Nation. Pictures! Pictures are great because they allow us to experience the awesome without having to contend with the many cumbersome burdens of phonetics. 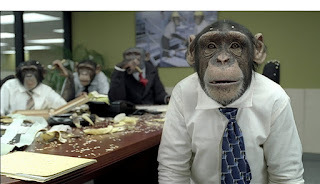 Above, you’ll see our first picture, Chimps at a Board Meeting. I think we can all agree that it’s pretty awesome. I mean, what could a bunch of chimps possibly have to meet about? Synergy, perhaps? And why hasn’t their monkey company switched to business casual? Come on chimps, get with the program. It’s 2009. In the coming days and weeks, keep an eye out for more awesome pictures. And, if you haven’t become a follower of The Norman Nation yet, click Follow in the top, right-hand corner. As far as I can tell, being a follower offers no benefits whatsoever beyond helping me feel less sad inside. Quote from Matt Norman at every E&S creative meeting: "Let's add a monkey, monkeys are always funny." And I am yet to be proven wrong.